Puerto Rico Tourism Does It Better? Really? Puerto Rico Tourism Does It Better By Not Believing in Local Resources. A few days ago I wrote Puerto Rico 1st Needs to get the Product Right regarding on how clueless the Puerto Rico Tourism office is towards online marketing and blogs. Today I was watching TV when I saw the current ad that they are running with the “Just Think Campaign”. The narrators voice does not represent our culture in any way. Energy of the images and video is does not tie to Puerto Rico projects. The video is not inviting. Call to action is not clear. Overall I really don’t think this campaign invites anyone to act upon the advertisement. I wonder how they are measuring the the cost of all these main stream advertisements. I say cost because someone needs to convince me otherwise that they are getting the adequate return on investment on the expense they are incurring. A few weeks ago I found out that the Puerto Rico Tourism office is using an outside of Puerto Rico firm to handle social media (which might not be a good idea if they had someone locally getting the real Puerto Rico perspective). I was very disappointed because how can you convey a message of inviting people when you go to the outside to grab resources. I really would like the Puerto Rico tourism department to evaluate how many dollars are being thrown away to the outside when our tourism industry does not bring in the dollars to help the economy. I really think that an adequate campaign can keep some of those dollars (or even better yet, most of them) locally and help improve the economy while bringing more people to visit Puerto Rico. Once again why don’t they make the investment in some of the many issues that can be easily addressed with most of the money being thrown away. Do you think non local resources can create the proper connection to promote Puerto Rico? Is the current campaign inviting? Does it make you book a trip to Puerto Rico or at least recommend it? Just a few days ago I read a post regarding on how entrepreneurship is more than needed on my Beautiful Island of Puerto Rico. Today I read a tweet, which made me very happy since it was regarding how well Medalla Beer and the Cerveceria of Puerto Rico where doing on the island. First time in 3 decades that a beer elaborated in Puerto Rico is the Local Leader. The only local Brewery wholly owned by Puerto Rican Capitalists. Medalla obtained 31.8% of market share with its closest competitor being Coors Light with a 30.2%. These stats where part of a Symphony IRI Group Market Study. The Nielsen Group also reported (for the same period) Medalla to have had a 34.3% of Market Share compared to Coors Light having a 29.2% market share on the Island. Here is one of the ads I use to see of Medalla Light as a kid. Which in my opinion targeted my generation into making this happening. The reason I was triggered to write a post although I am not a heavy drinker was when Javier Soler, General Manager of Miller Coors in Puerto Rico made a statement to El Nuevo Dia that these numbers and statements where false and very far away from reality. The Cerveceria of Puerto Rico Management responded that if Mr. Soler did not agree with the numbers then he was completely biased. 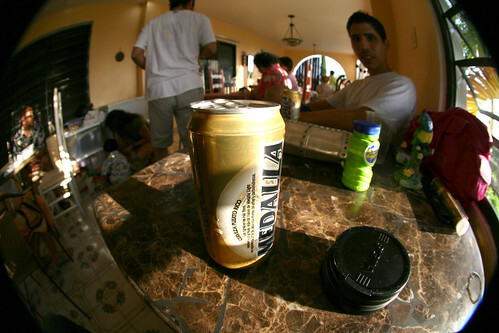 Personally I am not a drinker but the few times a year I have a beer it better be Medalla if I am in Puerto Rico. While I worked in New York I when I drank more frequently I would go to the only place in New York City to get my Medalla. I have had also many friends from countries such as India, England, Japan, and other countries which really enjoy having a Medalla and would love to have access to it outside of Puerto Rico. On my Part I would love to send a message to Mr. Soler with a proposal to Boycott Coors Light on the Island so he can get a clear message on the dominance of Medalla.If you are near tourists (some of the things I used to do while I was a Bartender) make sure you suggest them trying Medalla. If you see a friend drinking Coors light make sure you let them know that it would be great if they change to Medalla. After all If there are people like Mr. Soler that try to tarnish the efforts of locally owned companies. Then we should pacifically let them know we don’t agree and defend the Cerveceria of Puerto Rico and other locally owned companies. Maybe then we can convince the Cerveceria of Puerto Rico to export Medalla elsewhere. Which will clearly bring benefits to our locally economy. I had created a group on Facebook with people wanting Medalla outside of Puerto Rico it would be great if you also join (especially if you are not on the Island and want to enjoy your Medalla). I would recommend using the following hashtag on twitter to get the message clear of a full boycott on Coors Light #NoMasCoorsPR. It would be also great if you share a possible slogan on why you prefer Medalla over any other Beer. Also I invite you to Join Medalla Like Page on Facebook.